PLEASE NOTE: Please Do Not Fill Your Cartomizers With Over 2.2 ml of e liquid at one time. Over filling can result in liquid shorting out your Aristo Battery. You won't know until you try! Trying an eCigar from Aristo Cigars is a unparalleled experience No Other electronic cigar company can offer. With our E Cigar Patented Technology and Design, Aristo Cigars is truley in a class of its own. Experience for yourself the redefining ARISTO E Cigar! The ARISTO, is the highest quality and best performing Refillable Electronic Cigar available today. 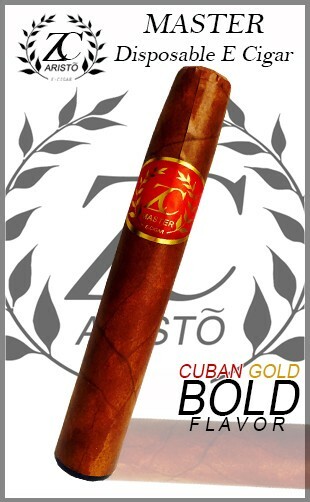 The Aristo sophisticated look paired with its amazing flavor makes it a must have for any cigar enthusiast. Written up and reviewed in DIGITAL Trends as the top performing electronic cigar in the nation! Our new Disposable E Cigar the MASTER is a winner. The rich Cuban Gold taste leaves you wanting more after every puff. It is perfect for a day on the go. The ARISTO E Cigar is in a class of its' own being RAVED about in a full article by DIGITAL TRENDS, and for good reason! 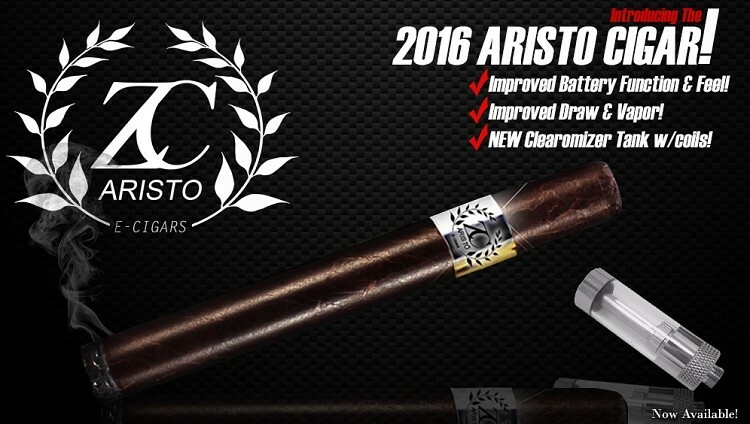 Not only does the ARSITO Electronic Cigar provide an outstanding, realistic cigar experience, it allows the cigar enthusiast to dial in their choice of taste & aroma. ~ The ARISTO E Cigar is the only refillable electronic cigar available, that allows the user the ability to pick their e cigar juice flavor and fill themselves. ~ The ARISTO E Cigar holds approx. 3ML of e juice, providing over 1,000 puffs per fill! ~ The ARISTO E Cigar Truly Redefines The Cigar Experience & Allows Cigar Enthusiast The Ability To Enjoy Their Cigar Indoors.